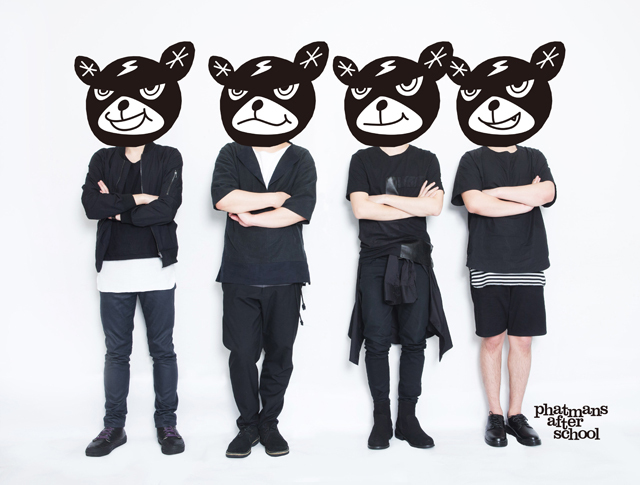 phatmans after school is a four-piece band from Sapporo. They use bear icons ,never showing their figure. Their major label second single “Tsukiyomi” was chosen for an ending theme of a TV anime“Yozakura Quartet Hana no Uta”. In 2014, they released their first album “Sekaono kotoha” going onto 7-venue solo show tour, which was a complete sold out tour. In 2015, they released their first double A side single “ FR/DAY NIGHT / Nanoka kan”, going onto a joint tour. On May 18th they released their second album titled “Unchronicle” after 18 months interval, followed by a solo show tour. ※phatmans：”phat” is from an American slang meaning “cool”. They made up a word “phatman” mening “cool boys who shine afterschool”.